Students today have a hard time imagining the fiery debates that took place from the 1970s to the mid-1980s about the need for women’s studies at Swarthmore. 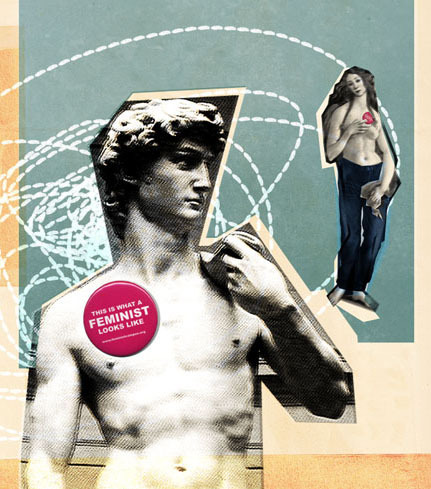 With the Second Wave of feminism came a new and growing consciousness that women’s voices, women’s scholarship, and women’s contributions had been omitted or were grossly under-represented in academia. Peter Schmidt, professor of English literature, was finishing a Ph.D. at the University of Virginia in the mid-1970s and remembers the energy and excitement of women’s studies programs exploding onto the academic scene. The argument for women’s studies wasn’t just about the gender breakdown of the faculty. While Swarthmore dragged its feet on the question, feminist scholarship galloped ahead at major universities and other liberal arts colleges. Yet these exciting new ideas were barely trickling into the Swarthmore curriculum, which was still overwhelmingly dominated by white male scholarship. 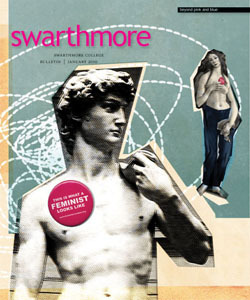 When the question of starting a Women’s Studies Program at Swarthmore was put on the table for discussion in the early 1980s, the response of many faculty and administrators was cautious. Some dismissed it as a passing fad. Others questioned the academic rigor of the young field. According to Schmidt, it was politically dangerous for nontenured women to speak out too loudly in favor of women’s studies. But a number of male professors came out in support, and the handful of tenured women, including Jeanne Marecek, professor of psychology, kept the pressure on. Twenty-three years later, a lot more attention is paid to gender throughout the curriculum, says Marecek. And for the first time in its 145-year existence, the College has a woman president. Perhaps those changes may be credited, in part, to the presence of women’s studies at Swarthmore. Beyond Pink and Blue: Move over, women’s studies—there’s a new way to think about gender and sexuality.